Chacha's Garden i Pushkar, Indien: Reservér nu! Here you are a honored guest and a welcome friend. At Chacha's Garden we are most interested in our guests happiness. So we fit in to what you need and want. A friendly face, a word of advise, some time without being talked at or fussed over. Its all possible. 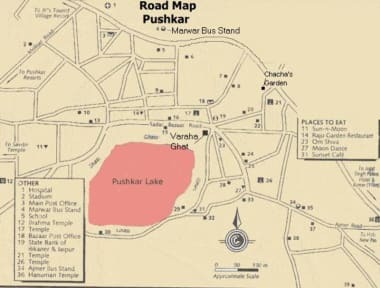 So come explore Pushkar, get some hints about its quiet side, hang out in our garden and chat the hours away. What ever it is you want you'll find us ready to help. The rooms are clean, cared and set around a peaceful courtyard garden were you can relax away from the maddening crowds. There is also a cafe offering some more unusual Indian dishes along with some of the more usual and some things you might know from back home. All rooms have ceiling fans, big beds, clean sheet and blankets. All bathrooms have water heaters. There is a cafe, and a hall for sitting eating and talking. There is a collection of books and games for you to use while your here and Internet access here and WiFi capability, so if your traveling with you laptop its possible to surf the web from any were in the property. The Kitchen is open to guests so if your missing your own cooking or want to try your hand at something new you are welcome. 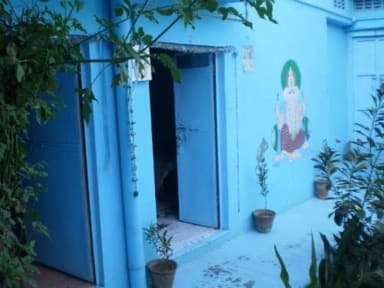 We are just one minuet from Varaha Ghat, which is the center of town, but its much more peaceful as its off the main market, just a little bit off the beaten track. We have call back facilities. We can organize Hindi Lessons. We can organize tours of Pushkar. We'd love to help you enjoy your trip in India, so please come by even if its just to say hi! PLEASE NOTE; During the camel fair 18thst - 29th Nov we offer Tents because of the high room demand and to offer some lower price options, these are the rooms offered for 500 IRN per person per night, please do not book these unless you are happy to stay in a tent. The tents have two charpoy beds and are private with common bathroom.